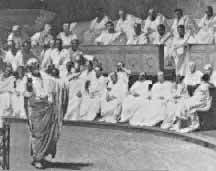 The rich and powerful people of ancient Rome were the patricians, who governed the city from the Senate ( the Senate was Romes governing body during the republic voted into office once a year by an Assembly of citizens ), and the equites, or men of property. All the social and most political power was in the hands of a few ancient families, such as Cornelii, the Julii ( the family of the Caesers) and the Aemilii. The Senate lost most of its power under the emperors, but the patrician families still led public opinion. Most patricians had, beside their house at Rome, a family farm in the country and a number of villas in pleasant spots of Latium in central Italy or in the south. Town and contry houses alike were beautifully built and designed for their owner's comfort. The Romans believed in making their sons fine soilders so after he became a Roman citizen he was enlisted on his first military campaign. On his return from military service the son of a patrician almost always entered into politics, and the sons of equites sometimes did the same. A young man first stood for election as an aedile, or city councillor. The aediles looked after the corn supply and public amusements. The next office was that of the quaestor, or a secretary of the treasury. The next step was to be elected praetor, or judge. After that, if he where lucky, a man might be offerd a province to govern ( in the days of the Empire ) or stand for consulship. Under the republic the consuls were magistrates who had the greatest power in Rome. At any time a patrician could stand for election as a tribune, or political leader, generally one who championed the rights of the common people against the Senate. A tribuneship was a dangerous post because its holder was often in conflict with powerful nobles, but for an ambitious man it was the quickest way to success. In Rome a successful patrician spent his days somewhat as follows. He rose at daybreak and spent an hour or two in the atrium, interviewing people who had come to him for help. In the late Republic and in the Empire these people where mostly his freed slaves and their children. The patrician felt it his duty to help out in any way he could and to plea for them in the law courts if necessary. After a light breakfast the patrician went down to the Forum, acompanied by all the friends and clients he could assemble. The day was spent pleading in the law courts or sitting in the Senate. In the evening he ate the chief meal of the day and invited guests to it. The men reclined around the tables on couches as they ate, but the patricians wife only took her meals with him if he was alone. Aedile - Roman magistrate, responsible for the Games and the maintenance of the temples. Censor - Roman magistrate. He is responsible for the public moral and had to put out to tender projects that were to be financed by the state. Proconsul - Roman magistrate, former consul in charge of a province. Dictator - Roman magistrate with extraordinary powers, appointed during an emergency. The word dictator originally meant 'the one who dictates' or 'gives orders'. The negative connotation is a later development. Praetor - Roman magistrate, responsible for the administration of justice. Praetorian Prefect - Roman magistrate, responsible for the imperial guard and the administration of justice. Prefect - Roman official, appointed by a magistrate or the emperor. Procurator - Roman official, appointed by a magistrate or the emperor. Tribune - Roman magistrate whose task it was to protect the people against oppression. The Romans first code of law was established around 450 B.C. On 12 separate tablets, twelve legal experts wrote down a list of Roman customs about property and punishing people who did wrong. This code was called the laws of the 12 tables.